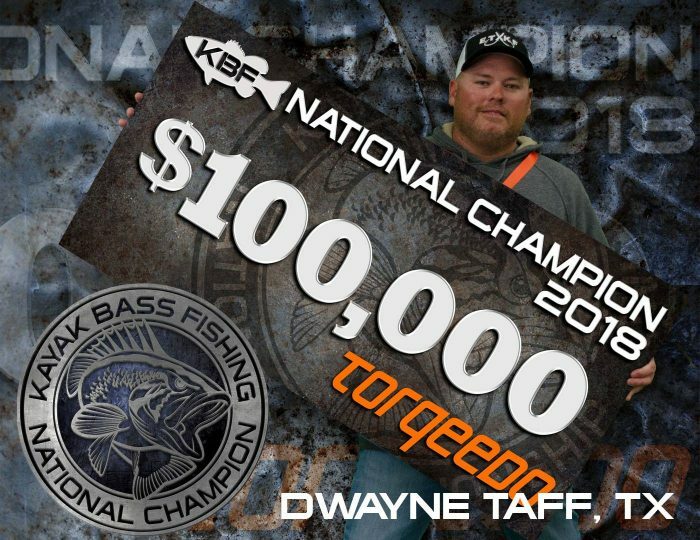 Paris, TN – March 25, 2018 – Dwayne Taff won the Kayak Bass Fishing National Championship held on Kentuck y Lake, taking home $100,000. Torqeedo renewed its longtime commitment to the sport and returned to the 2018 tournament as Title sponsor. Dwayne’s 10 fish total measured 173.50 inches, besting his closest competitor by less than two inches. Last year’s champion, Kurt Smits, won with 188.5” inches. Torqeedo’s Ultralight 403 was the first electric motor system developed specifically to efficiently propel canoes, kayaks and other small boats. Updated with a 915 WH lithium battery for 2018, the Ultralight 403 C model weighs just 22 lbs, has a top speed of 6 mph and a maximum range of more than 75 miles at 2.6 mph. The Ultralight 403 C comes standard with GPS and onboard computer, with a convenient USB socket that charges a phone or powers a light or other electronics. For more functionality, paddlers can add a foldable solar panel or the optional TorqTrac app, which displays all motor information on a smartphone.